The Horizon View Client is the software package that connects Lehigh users to our virtual software system, and enables them to run software that isn't installed directly on their devices. It runs on numerous platforms, from Windows and macOS to Android and iOS devices (phones and tablets). See the service page for more information. The instructions below show you what you'll see when using the system. 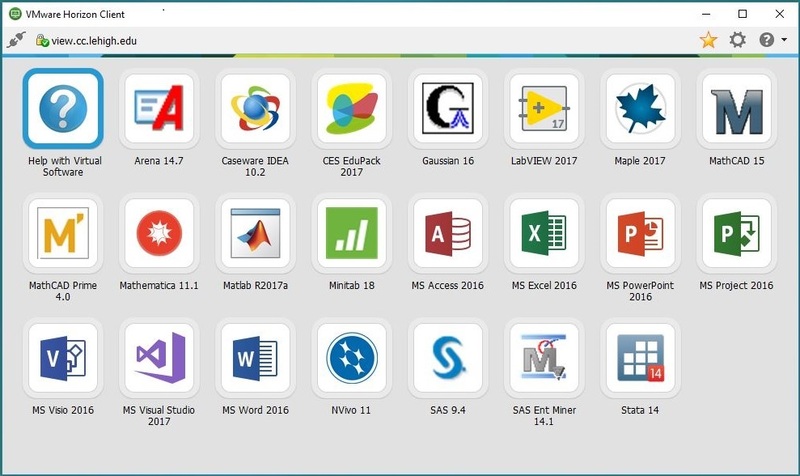 After running the installer for your operating system, find the icon for the VMware Horizon Client on your device, and tap or double-click on it to start the client. Here you'll see a list of servers to which you've connected in the past. The first time, there will be only a placeholder. Click the New Server button, enter view.cc.lehigh.edu and click Connect. Android Users: Accept the request to "... make and manage phone calls." This is required for the software to run. Next, enter your Lehigh username and password. Once logged in, the client software displays icons for available programs. Be aware that some programs expect to run on larger screens, and on devices with smaller screens, you may need configure the client's 'Touch' settings, and turn off Windows Native Touch Gestures in order to use your device's 'pinching' gestures to zoom in and out. Mobile clients have separate 'tools' buttons, shown here, to expose additional features, including the Settings page and the Disconnect button. When you open or save files, remember that the best place to do this is in your Personal or Departmental Network Space (H-Drive or I-Drive). 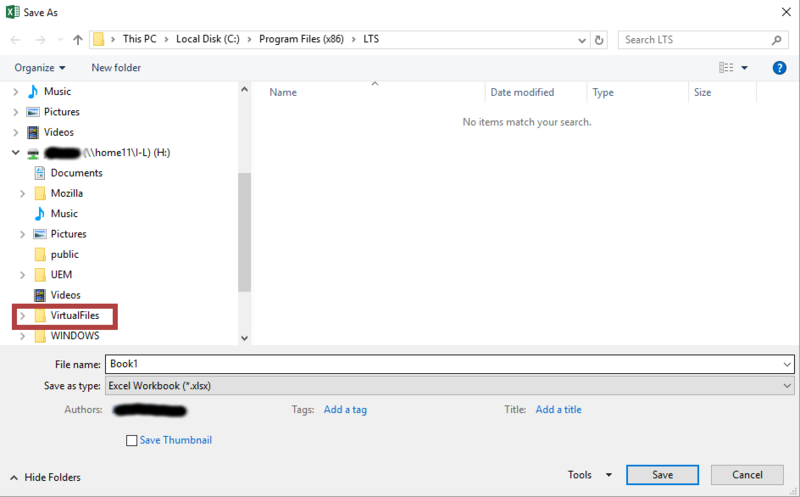 Software running through the Horizon Client uses the Windows file system, so knowing how to Find your Network Storage Spaces there is helpful. If you don't navigate elsewhere, the system will point to the VirtualFiles folder inside your H-drive by default. When you're finished using the program, quit it as you normally would by either clicking the Close box on the window or selecting the program's Quit or Exit command from its File menu. Then, be sure to disconnect from the view server by finding and clicking the disconnect button in your version of the client. Finally, if you need to access your files from your personally-owned computer, either before or after you use the Horizon client, you may need to Connect to your Personal Storage Space in macOS or in Windows. 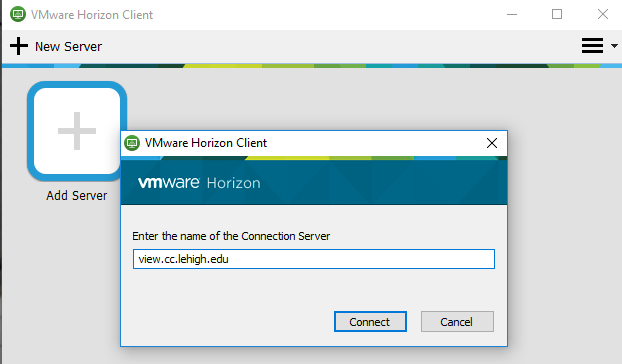 You may also like to see how to Configure the VMware Horizon Client to Connect Local Drives in Windows and in macOS.